唐启政, 孙志宾, 王新安, 马爱军, 杨双双, 黄智慧. 2019. TANG Qi-Zheng, SUN Zhi-Bin, WANG Xin-An, MA Ai-Jun, YANG Shuang-Shuang, HUANG Zhi-Hui. 2019. Oceanologia et Limnologia Sinica, 50(2): 409-419. TANG Qi-Zheng, SUN Zhi-Bin, WANG Xin-An, MA Ai-Jun, YANG Shuang-Shuang, HUANG Zhi-Hui. 2019. EXPRESSION ANALYSIS AND FUNCTIONAL VERIFICATION OF PROTEIN DISULFIDE ISOMERASE SmPDIA3 IN TURBOT SCOPHTHALMUS MAXIMUS[J]. Oceanologia et Limnologia Sinica, 50(2): 409-419. Abstract: We cloned the SmPDIA3 gene of turbot Scophthalmus maximus using the SMART-RACE technique. The cDNA sequence of SmPDIA3 is 2083bp in length and includes a 1479bp open reading frame encoding a 492 amino acid signal peptide containing 17 amino acids. The predicted molecular weight is 54.92kDa, the theoretical isoelectric point is 5.40, and GenBank accession number is MG765516. Tissue expression analysis showed that SmPDIA3 gene was expressed in intestinal, iliac, liver, and other tissues, with the highest expression in the liver and the lowest in the brain. 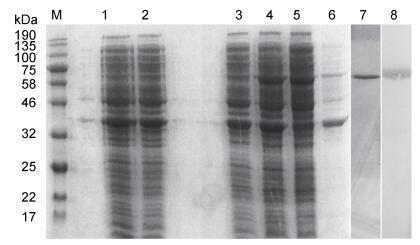 In addition, we studied the expression of SmPDIA3 gene in the intestine and liver tissues after a thermal stress. 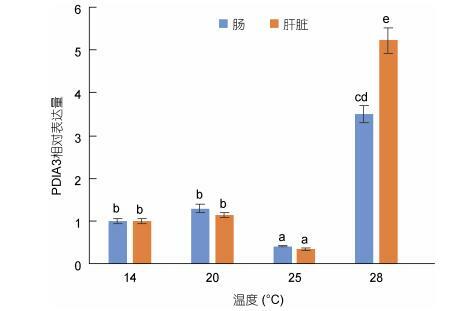 We found that the relative expression of SmPDIA3 gene increased with the increase of temperature, and reached the maximum at 28℃. 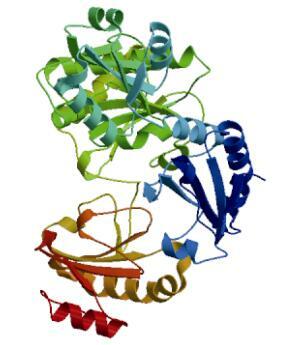 Using prokaryotic expression technology, the pET-28a-PDIA3 prokaryotic expression vector was constructed and the target protein was successfully expressed in the supernatant. 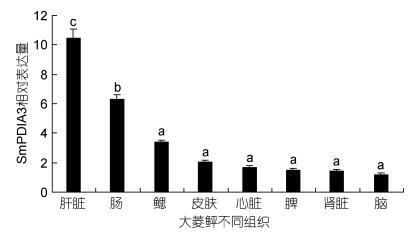 Finally, the refolding experiment of denatured lysozyme was designed to verify the function of the SmPDIA3 protein. We found that SmPDIA3 protein can assist the correct folding of denatured proteins, and has obvious molecular chaperone function.